We are a registered non-profit, Non-Governmental Organization (NGO) that is fully focused on improving the lives of those in deprived communities through volunteering. Your contributions are directly involved in our combined efforts to help the people that are really affected. 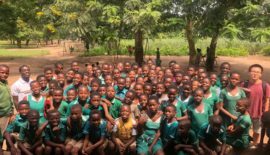 Through this, volunteers and interns gain firsthand experience of the real issues facing the development of Ghana. Your work is well recognized and appreciated by the chiefs, local leaders and members of the communities we serve. Patriots is fully committed to the United Nations Millennium Development Goals and work with other leading institutions including the Department of Social Welfare, Ghana Health Service, Ghana Education Service, District Assemblies, member NGOs and many more. We are a Ghanaian run organization. We have friendly local Ghanaian staffs who know our beloved country inside and out. We also know exactly how to help volunteers and interns arrive from overseas and orientate them with the local cultures and customs. We are looking forward to immersing you in our homeland, teach you our local language, take you to meet members of the community and show you some of our favorite places to travel within Ghana. We will also always be available for any queries or problems that may arise and know directly how to assist you. Due to the wide network of Patriots, volunteers and interns also have the opportunity to work on projects in different parts of the country to be able to experience the different aspects of a particular project and the different cultures of the country. Volunteer/Interns working with Patriots Ghana gain a wide range of experiences and skills through their exposure to Patriots work in deprived communities and the cultural exchange between Ghanaian and international volunteers. We are a very passionate and selfless and patriotic team who are committed to our values and there is high level of transparency and accountability due to our decision making structure and nationwide membership. This ensures that money that goes to Patriots is properly used for its purpose and accounted for. We are registered by the Ghana Government as an official Non-Profit Organization. We do not want to make profits from our projects. Our program fee for volunteers and interns is honest and dedicated to them. Our desire from our staff to help and improve the lives of the needy communities is also honest and real. Volunteers and interns will be placed in areas where their assistance is genuinely needed. They will not just be an ‘assistant’ in somewhere which doesn’t really need them there. Placements are specially selected to make the most of their experience. They will have a direct impact on the institution they work with and really will make a difference. They will also be extremely appreciated for their help and welcomed to the local community. Our programs are flexible. We can adapt the program to best suit the needs of the volunteer or intern. We can even combine some aspects if possible. We always ensure that the volunteer or intern gets the most out of their experience. We do not solely rely on volunteers, interns and foreign aid as we raise funds internally among members. We aim to continue to be sustainable and help inter-community projects between local Ghanaians. We always have opportunities for ongoing projects that Patriots organize to improve the community internally and with local institutions. In addition, we would like to work together with our volunteers and interns to accept shared ideas, and help local people improve their way of life sustainably for the future, not just for the time they are visiting. You are always welcome to the Patriots network, and we would like to stay in touch and have a continuous relationship long after you leave. Patriots Ghana is a registered non-profit non-governmental organisation that serves to develop, encourage and empower Ghanaian citizens and organisations to undertake community services geared towards national development. 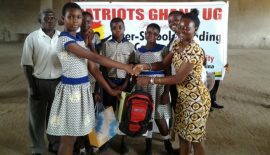 Patriots Ghana also networks and collaborates with organizations working in the fields of Health, Education. Sign in to our platform and receive frequent news updates. Copyrights © 2016 PatriotsGhana. All rights reserved.